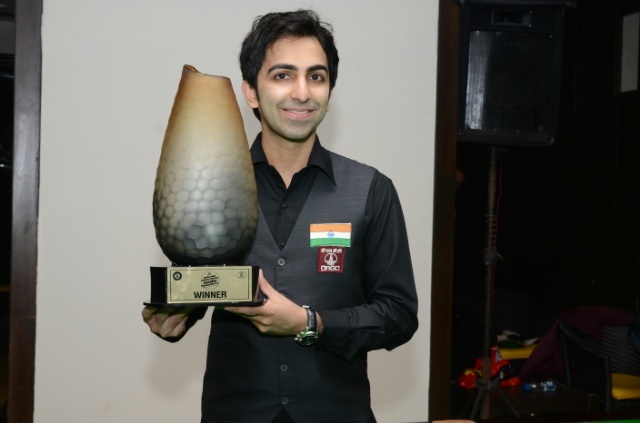 Pankaj Advani with the trophy he won at BRC on Sunday. KOLKATA: Sixteen time World Champion in cuesports, Pankaj Advani, put up a flawless display to outclass Aditya Mehta 5-1 to win the 3rd Kolkata Open National Invitation Snooker Championship 2017 at the Bengal Rowing Club. Mehta, who had won the previous two editions of the championship, started off strongly, but Pankaj took the game away as soon as he got the chance. In the first frame, Advani was trailing 23-56, but he took advantage of Mehta’s miss as he posted a break of 60 to take a 1-0 lead. It was challenging second frame with both the cueists refusing to concede an inch. Mehta led 13-9 before Advani wrapped it up in an unfinished 67 break with only the colours left. Mehta led 47-5 but Advani held his composure to cruise to a 3-0 lead and then was up 4-0 at the break. After the break, Mehta thundered to a 101-0 with the first century break but it was too little too late as Advani produced his best in the sixth game to win his maiden title in the Kolkata Open with an identical break of 101. The result: Pankaj Advani bt Aditya Mehta 75 (60)-56, 76 (57)-19, 87-47, 73-17, 0-101 (101), 101 (101)-00.